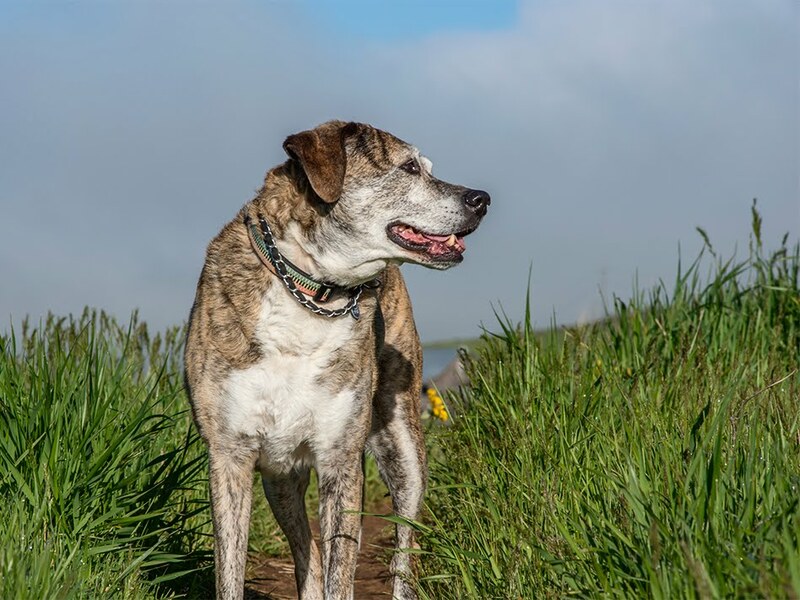 Taking a blog vacation for the month of August. Bandon, Oregon on the southern Oregon coast is known for its otherworldly rock formations and also its wonderful sand. 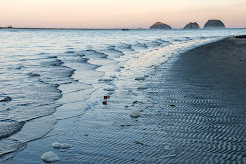 I blogged yesterday about an early morning photo just before low tide. 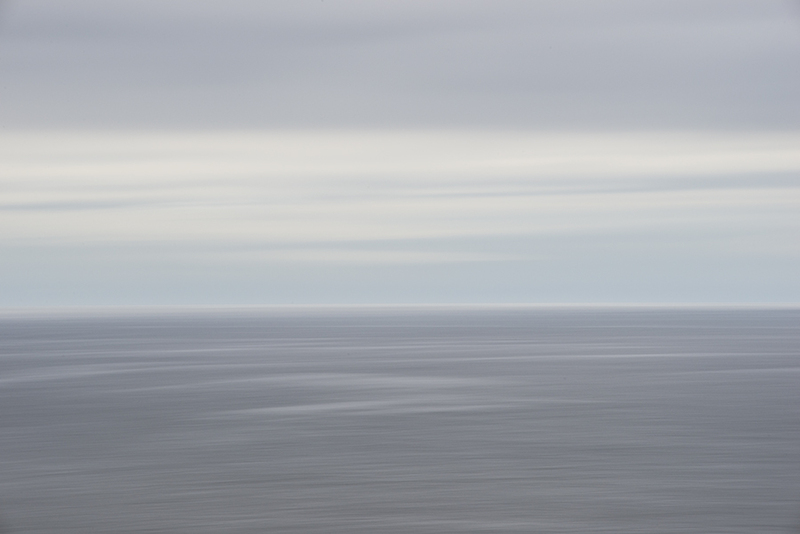 Today's photo is from later in the morning when the clouds were clearing out. 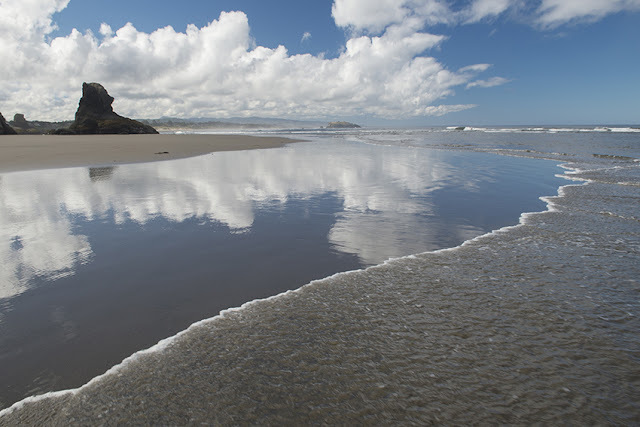 The tide started coming in by mid morning, creating the great reflection I love so much on the wet Pacific Northwest sand. I was just starting to hone in on the photo I was looking for when I lost this good light. 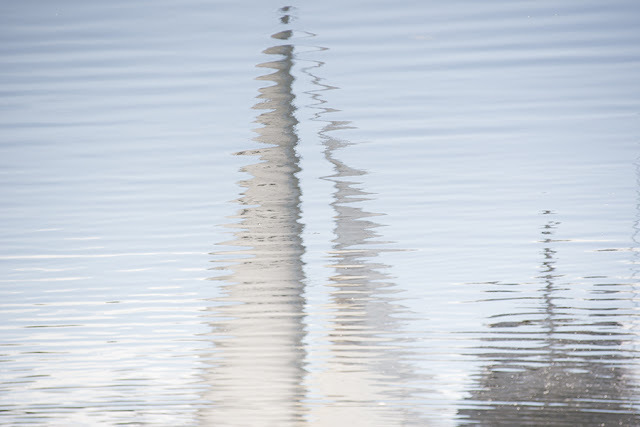 It's hard to get a good reflection when the sun is too high in the sky. Still, a fabulous morning on the coast! This water felt so refreshing. Wish I were still there! 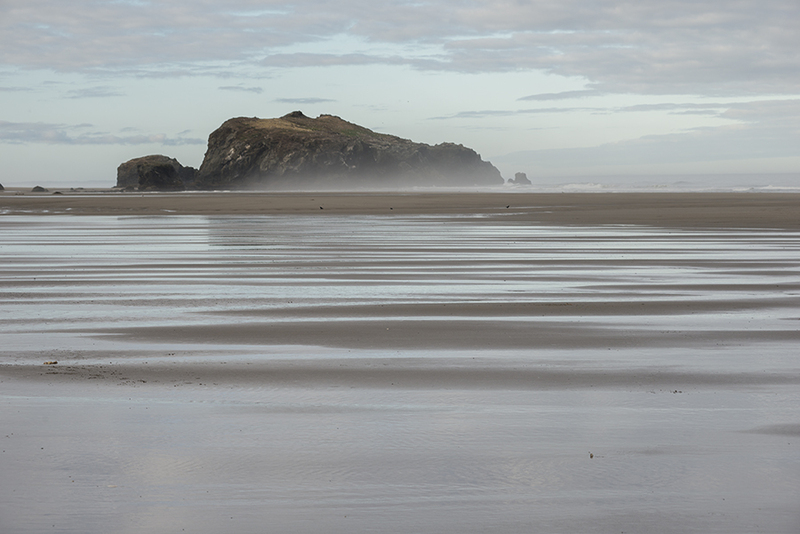 Early morning in Bandon, Oregon. for some beach-combing and photo-taking. Here's the overhead view of the sand labyrinth in Bandon, Oregon that I blogged about yesterday. When I got to the beach in Bandon early Friday morning I had to make the classic beach choice, walk to the right or the left. I picked left because it was still very overcast early in the morning, and the light was better to the left (photographer criterion) even though the rocks did look more interesting to the right. I think the labyrinth was probably under construction when I started my walk, because it would have been just before low tide. And the labyrinth was, of course, to the right. So it goes. I would have loved to see the construction. Still, it was really such a fun surprise to happen upon later in the morning when I made my way to this side of the beach. One update I want to make from yesterday's post though. I said that they create a labyrinth everyday, but that's not correct. Sand conditions have to be right, and there might be other factors that determine dates as well, perhaps low tide timing. So today, I'm including a link to the same website, but this time to the schedule page. 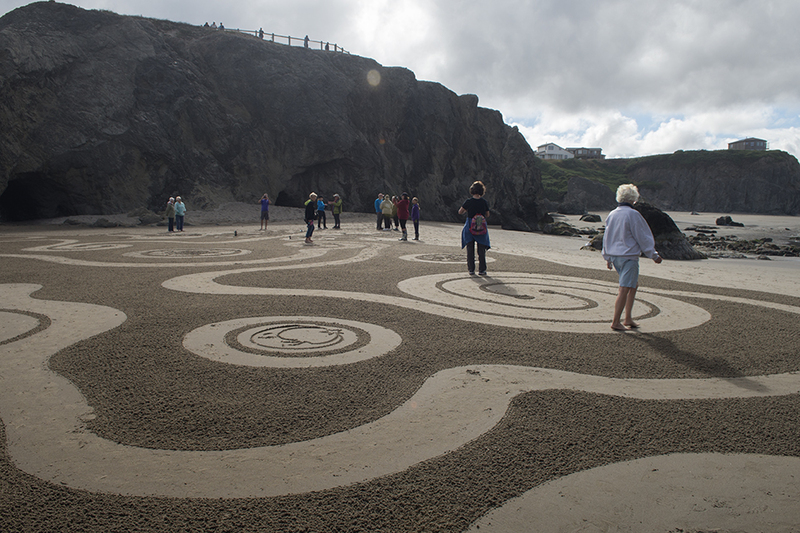 The next labyrinth constructions are scheduled for August 5th and 6th. 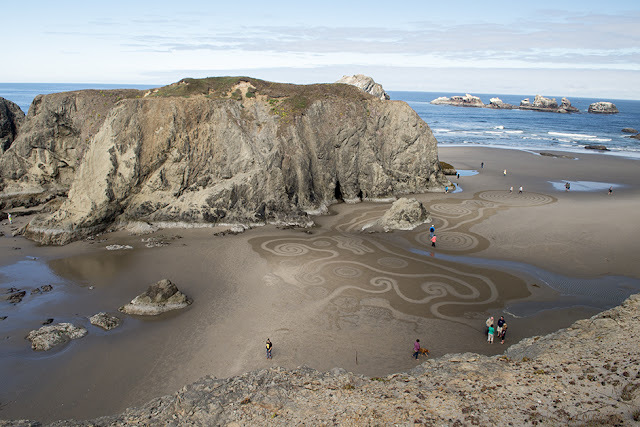 In Bandon, Oregon, which is a truly magical stretch of coastline in southern Oregon, there's this guy who comes out to the beach everyday at low tide and draws a huge walkable labyrinth, different everyday. On the day of my visit, I was walking along the beach, enjoying the rocks and the waves, when I came upon a crowd of people all gathered in one place. What a surprise to find this amazing labyrinth! It takes 45 minutes for the artist to carve out the labyrinth path, and then he has volunteer beach "groomers" who use rakes to fill in the patterns. Everyday the tide washes away his labyrinth, and the next day he creates another. I'll post an overhead view tomorrow. If you're curious to see more though, here's a link to his website, Circles in the Sand. It includes some videos of the labyrinth constructions. Clear skies and fair winds in the south Puget Sound today. 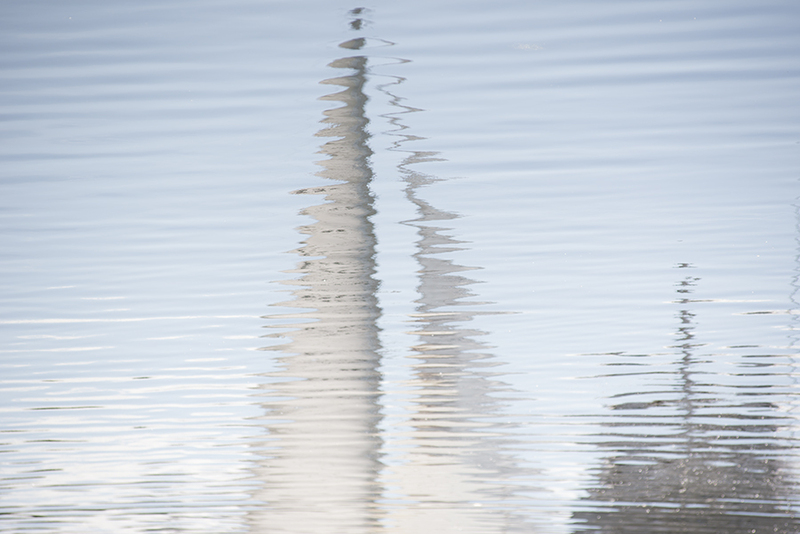 A nice day to head out in your sailboat...if you have one. as they sail past the still waters in the marina. 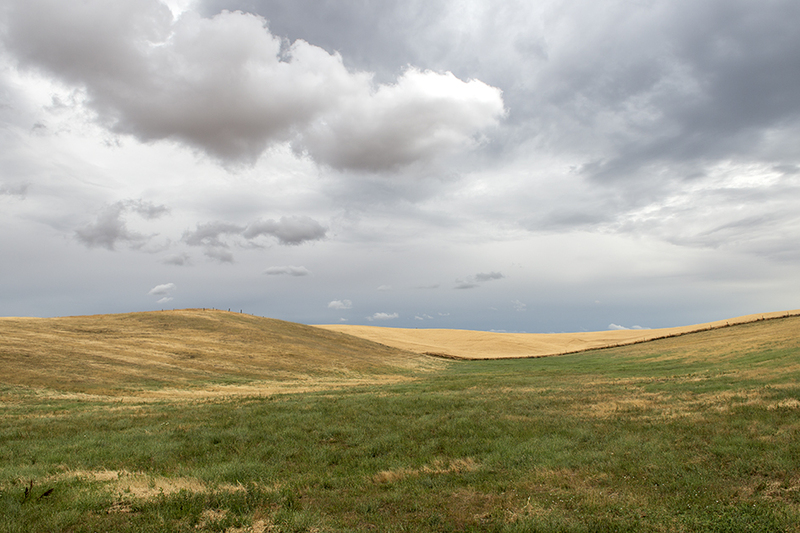 Another view of the Walla Walla Valley, after a rare summer rain. The clouds were just beginning to clear in this scene so it has one of my favorite lighting combinations of a weak sunlight on greenery and storm clouds. And yes, if you look closely you can see the fence line dividing the green and brown fields. I had the privilege of participating in Art in the Garden at the Naturescaping Wildlife Botanical Gardens in Brush Prairie last Sunday. These beautiful gardens, open year-round, are maintained by volunteers dedicated to teaching the community gardening ideas to attract wildlife to their gardens. This fabulous echinacea was blooming in the Flying Flowers Garden, which is a butterfly garden so full of blooming flowers right now that the perfume is almost overwhelming! 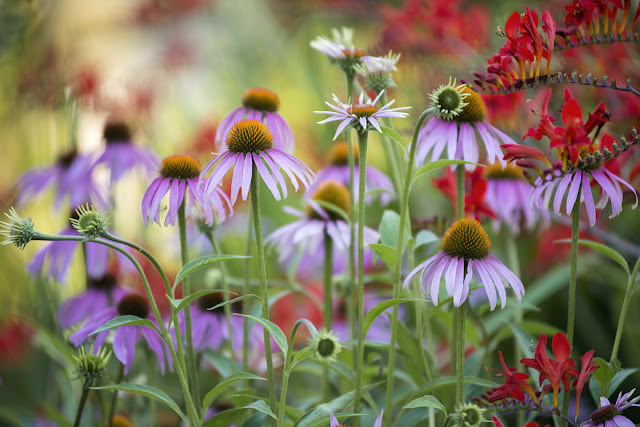 I've been wanting to photograph echinacea at an herb farm out in Trout Lake, but I have yet to hear back from them. So in the meantime, I was thrilled to find this hardy patch of echinacea at the Naturescaping garden. I returned in the evening to photograph the flowers in the warm sunset light. No butterflies to be seen, maybe because of the late hour, but plenty of busy bees and hummingbirds. When people hear Walla Walla, most think of onions or wine, two commodities grown in this region. To my eyes, driving through Walla Walla earlier this week, I saw wheat, wheat, and more wheat. I did see one small onion field on our way in, and I wish I would have stopped for a photo. I saw that the onion festival was in June, so maybe that crop has an earlier harvest then I realized. I was trying to find a vineyard (tasting rooms abound!) but missed that too. Next time I visit, I'll need to make more time for touring around the countryside! 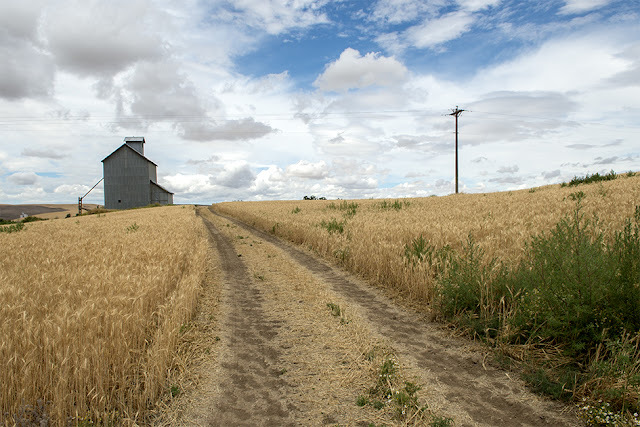 Loved all the wheat, with harvest just beginning on a few fields, and this terrific little grain elevator, deep in the fields.